The Impact Downtown Albany project is focused tightly on core of downtown. The number of residential options in downtown Albany has been steadily growing over the last few years. And as mayor Kathy Sheehan at an Impact Downtown Albany event Tuesday at 60 State: "We really are gifted with a lot of the great bones that we need to fulfill the promise of downtown living." So, how does the city move from promise to actual development? What are the challenges? What's the potential? An apartment at 23 N. Pearl. 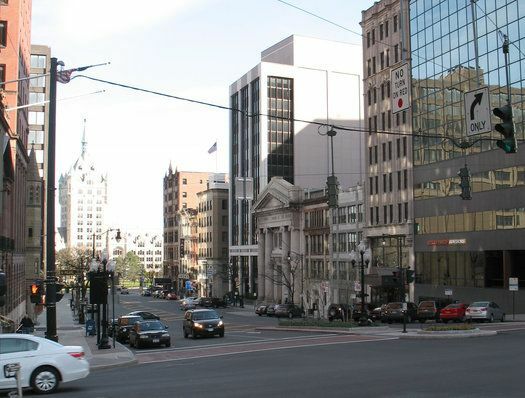 Ben Carlson -- from Goody Clancy, the consultancy heading up the Impact Downtown Albany study for Capitalize Albany -- said the downtown area has added 200 residential units during the last decade and another 200 are currently in the pipeline. "It's been clear that the market has been there," he said. 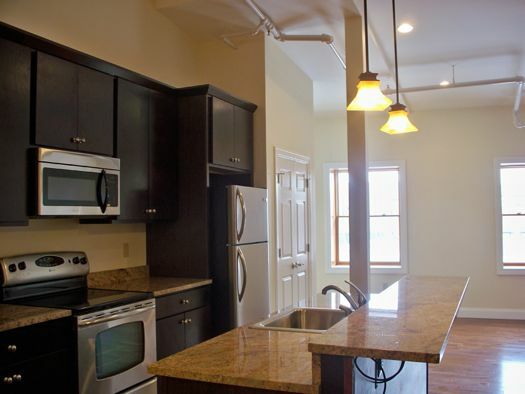 And Georgette Steffens, the executive director of the Downtown Albany BID, said residential units in downtown Albany have a 97 percent occupancy rate. + The downtown residential population is now about 1,250 people. + Residential rents downtown currently range from about $500 (for about 500 square feet) to $2,400 (for about 2,000 square feet). + Prices for condos range from about $200,000 (1,250 square feet) to $540,000 (2,400 square feet). 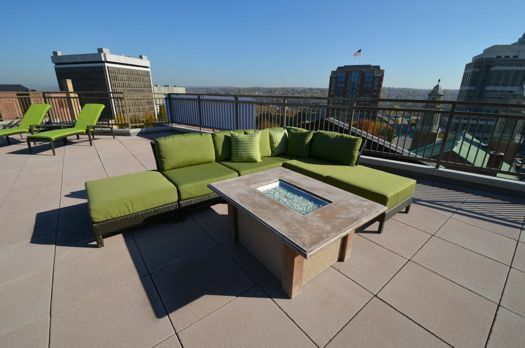 A rooftop patio at 17 Chapel condo building. Carlson said those two groups are driving a "sea change" from the suburban-style development of the last 50 years. Another demographic trend pointing toward urban living, according to Laurie Volk: households are smaller. A big chunk of the households in the city of Albany are either 1 or 2-person households, which tend to be more open to something other than the 3-4 bedroom house with a yard. And single women, especially, are becoming a bigger part of the house buying market -- and that group also seems to be leaning toward more urban-style options. In recent years, there have been about 3,750 households moving to/within the Capital Region that fit the profile of being potential urban buyers/renters, according to Volk. About 3/4 of those people are young singles or couples. Another 20 percent are empty nesters and retirees. About 5 percent are families -- though the number of families open to downtown-style housing is also said to be growing. So, the thinking goes, if downtown Albany can capture some slice of the local market of people who'd be open to living there -- say, 5 percent of the rental market and 2 percent of home-buying market -- it could be in line to more than double its population over the next decade. That would give it more than 3,000 residents. 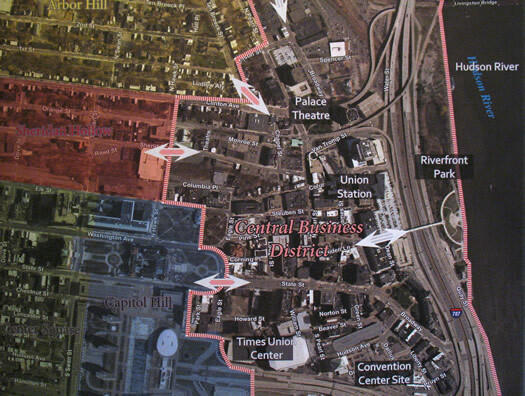 What would that mean for downtown Albany? Well, it's said to take about 1,000 households to support a block of retail. So another 1,000 or so households could widen the range of retail options there. People who live there are already hoping to eventually see some sort of grocery store -- maybe that becomes more feasible with double the population. There's also hope that a rising residential population has feedback effects for downtown. Here's how the thinking goes, according to officials: More residents could mean more and different retail options, including something beyond bars or restaurants. As the retail options multiply, more people are drawn to the downtown -- either as residents or visitors. As the neighborhood gains amenities, maybe it also becomes more attractive to employers -- say, tech companies perhaps -- that want to locate in areas that will be attractive to their employees. The new/relocated employers bring new residents and amenities, and the cycle continues to run, with development spreading outward. The challenge is getting up that first hill, developing that critical mass of residential units. It's a big push in the beginning. The most interesting part of the Tuesday presentation was something that might sound really dry: the financial math behind residential development projects downtown. Sarah Woodworth, one of the consultants, laid out the numbers behind two hypothetical projects -- one a conversion of office space, the other new construction -- both about $6 million. She ran through the costs of acquiring the property, construction, operation, taxes, and potential revenue from rents. All that funneled to the most important number (from a developer's perspective): the potential investment yield of the projects. Developers are looking for yields in the 7-8 percent range, according to Woodworth. The problem is that because of some of the costs involved with doing projects in downtown Albany -- especially the taxes -- the projected yield without any incentives is somewhere in the 4 percent range. Yep, way short of the target. So Woodworth ran the numbers again, folding in various tax incentives, like PILOT agreements and tax breaks on construction materials. Even with those incentives, the projected yield still fell a bit short of the target, but it was a lot closer: somewhere in the 6 percent range. The numbers presentation was really interesting because it highlighted how much of a speed bump the city's relatively high taxes can be to development, and why developers are always pushing so hard for incentives. It also provided some insight into why so much of the development downtown has been on the high end of price so far. The higher the rents, the closer the investment yield is to the target. Marc Paquin, the developer whose company converted a former printing company building into The Monroe apartments, said they've seen very strong demand for downtown residential, with a waiting list and multiple inquiries per day. But the rents are a bit higher than what a chunk of the people interested can afford. "The real challenge for our community is the math equation, and how to make the math work." "The real challenge for our community is the math equation, and how to make the math work," said Paquin, of how to development more units, and at a price more people can afford. Of course, any projection is based on a number of assumptions. We hope Impact Downtown Albany will eventually post these projections online so people can study them, critique them, and get a better handle on them. Because they did illustrate some of the challenges well. The talk of tax breaks and incentives for downtown development touched on a simmering issue in the city: Who should be getting these incentives, and how much? It's an issue that's also recently popped up as part of the Park South redevelopment. Imagine you're a smaller-scale landlord in the city, with maybe five or six apartments. You're watching the city give breaks and incentives to big developers to build new units -- which you'll be competing against for tenants. So, you know, where's your tax break? The bottom line is I appreciate the concept of a vibrant downtown improving the quality of life for the surrounding neighborhoods, maybe even the whole City, but the model we're using to "kickstart" this process is unfair to everyone but the lucky investor with money to begin with. The rest of us must continue to compete in the climate of high taxes. That's just not right. I do not support my money guaranteeing someone else an unrealistic profit. Someone else told me tonight that "the government is now picking who wins and who loses in the private sector." He's absolutely correct in that observation, and that's a very bad thing. We've heard other landlords make a similar argument at meetings for the Park South redevelopment plan. And as McRae told us last night, small landlords make up the bulk of the city's rental market. So it's an issue worth more focus from the city. Are there ways to get smaller property owners on board with something that people feel is more fair? Capitalize Albany has two more events of this type coming up, about commercial/office space in April, and retail in May (the specific dates haven't been announced yet). Based on this first event, they'll be worth checking out if you're interested in the topic. The Downtown Albany BID advertises on AOA. I'm surprised you can't hear the howls about this issue from Albany residential tax payers all over Albany.. Before the city starts granting any more tax breaks (regardless of what they are called) to anyone for anything, tell me who bears the burden of those tax breaks. Moving on, if you want me to give a flip about downtown Albany, then tell me what's in it for me as a residential tax payer.. Do more math. I'm old .. I've lived with a gutted downtown for 50 years. If the return on a re-vitalized downtown won't be realized for 30 years, don't expect me to care. And if there is a shorter term return cost curve, then show me the cost/benefit and the methodology. . Many of us who have lived here for decades are simply weary of this folderol. I am so tried of Albany politicians wrapping themselves in the cloak of a revitalized downtown, when the Emperor is really wearing no clothes. SHOW ME THE MONEY.. Demonstrate how a revitalized downtown benefits me, who rarely sets foot in downtown.. I agree w/ Mr. McRae. The model of providing tax incentives to spur development is unfair and shortsighted. The reason those one-off incentives have proven necessary is because the city's tax system discourages development. We should stop taxing improvements and shift the tax burden entirely onto the value of the land in question. That will cause speculators who sit on valuable downtown land w/o redeveloping it to have to pay more. It will act as a tax incentive for development (and bldg maintenance) while being fair and available to all. "Demonstrate how a revitalized downtown benefits me, who rarely sets foot in downtown.."
How does a money losing golf course benefit me, who doesn't golf? How does Alive at Five benefit me, who doesn't attend? As someone offended by the corporate christmas lights in the park display, I wonder how that helps me? Is there some way we could make the city focused just on me and have it just be about me? I mean, I pay taxes and stuff. I'm very tired of people who don't set foot in downtown saying they could care less what happens to it. If you don't care about your fellow citizens or your surrounding communities and you have no concept of the greater good, perhaps you should move. I see absolutely no problem with tax incentives that would enable developers to put up residential buildings downtown, as long as low- and middle-income housing is part of the deal. Here's an example of what can be done if the political will is there... this project included fees that went back to The City, as well as agreements with regard to providing affordable housing. No reason this couldn't happen on a smaller scale in Albany. What I would argue for, to help make this happen, would be increased gas taxes to encourage people not to drive and to take mass transit, and more tax incentives to get them to move back into the central city. Further, I'd provide incentives for businesses (department stores and the like) to move back from outposts like Wolf Road and return to State Street and the surrounding area. When we create walkable neighborhoods with places to shop, that's reason in itself for people to want to live in them. My girlfriend and I just moved to Saratoga from DC. The millenials argument is fairly accurate. We want a space where we can park the car and forget about it for a week at a time. I'm from Albany and would LOVE to live downtown but there is no "draw." I'd need to drive to the grocery store and any other shopping and the fact that most things shut down when the state offices do is a major issue. Needless to say, I couldn't convince my gf to move to a 5pm-8am ghost town. Talk is cheap and until there are amenities that aren't bodegas, the people will stick to the burbs. I go back and forth on the tax incentive programs. On one hand, they have been the primary tool to drive growth in many downtowns (and expand the tax base city-wide) across the nation, for cities often find themselves with tax bases packed with tax exempt properties (government, schools, churches, non-profits) putting them at a disadvantage against their suburban neighbors. Albany is certainly in this camp and as a capital, more so than most of our peers nationwide. However, as a tax payer, I do feel like a chump when I have to pay full value on my house while investors get a tax break. I still donâ€™t know where I fall at the end of the day, but thing some form of tax incentive is necessary in the early stages to help catalyze development. What this looks like and for how long is in the Mayorâ€™s and her development teamâ€™s court. My one solution I have often thought may be worth exploring is the establishment of scaled tax incentives to developers/landlords based on the level of commitment they have to future development. For example, a first time developer/landlord gets a small tax incentive, but if they commit to subsequent development, the incentives progressively scale up per development. Additionally, local developers get a bonus, especially if they show commitment to subsequent development. Again, the Mayor and her team would need to do a cost benefit analysis on how long to employ the scale and how far it goes. I didnâ€™t make the meeting and donâ€™t know if this was discussed (it may be a subject more appropriate to the retail meeting), but I think the city should have a business ambassador who can walk businesses, especially small business owners looking to open up in the city, through the process. It is convoluted and there is a lot of red tape and multiple agencies that one needs to navigate through (some I would argue necessary, a lot of it probably can be trimmed back) and I think this issue gets compounded with the high tax issue and drives away good business proposals. For instance, All Over Albany covered the growing food truck industry in the region and the City of Albany had fees and red tape well above our neighbors, causing issues for the expansion of this type of business in Albany. This needs to be assessed and the City should assign a dedicated ambassador to walk folks through the process. NYC did this and the â€œMade in NYCâ€ initiative is bringing in a lot of tech industry, hipsters DIY establishments, etc. A little dedication, assessment and collaboration on this could equally go a long way in Albany. Low class housing is one of the problems of downtown right now! Cops won't even go into the South End at night. Why? Projects. Why? Because of the big fat federal teat Albany gets to draw upon. You want a great downtown? Gentrify the hell out of it a la the area around Albany Med. Short of that, nothing changes. You can't have your cake and eat it too. I recently left the city suburbs and moved downtown. My neighborhood is beautiful and offers a lot of walkability (restaurants, parks, the plaza, the Palace, the Egg, Corning Preserve, the State Museum, coffee, etc.) The down side is that many of the streets in the Ten Broeck, Pearl and Columbia Streets areas are strewn with lots and lots of garbage all of the time. Itâ€™s pretty disgusting. Before the City begins with more â€œBIG plansâ€ perhaps they should get a hold on some of the smaller issues. Nobody wants to live, shop or visit an area thatâ€™s filthy. I lived on State St. for a few months and moved away. Why? Parking. THERE IS NO PARKING PROBLEM IN ALBANY!!! The problem was CREATED by the dimwits who ran the city. Everywhere you go there is restricted parking and/or metered parking. Why? There is plenty of parking if one didn't have to deal with the stupid meters and parking restrictions. Sure, sometimes one would have to park further away. I got four tickets (extremely expensive, I should add, which is another stupid thing) in as many months, enough to tell the city to "go to hell." Then, there's the annoying "move your car today/move your car again tomorrow" for street sweeping for absolutely no reason. Center Square is normally fairly clean and doesn't need two runs a week. Once a week, on week-ends, when most people are home and actually have time to play with their cars, would be enough. Rather than sweeping so much, increase the littering penalties substantially and run awareness campaigns. The money saved in labor would be enough to pay OT to sweep the streets on Saturday and Sunday. I love the city of Albany, but until the city decides to make life easier on its residents, instead of creating dumb rules to sustain jobs program, people and businesses will stay away. What business wants to open in Albany, when it is exposed to this moronic meter BS? People will go shop where they don't have to worry about a $50/$80 fine if they accidentally forget to load the meter. True story: I parked on Central at 5:50 to pick up a pizza. Metered parking was until 6, but I figured it would take me a couple of minutes. When I got out, 5 minutes later, I had a $55 ticket on my windshield. Really? Does the city really think that this will attract people? I'm glad there was a public reception on this topic and am excited to see what the Downtown Tactical Plan offers. I think it has long been overdue that Albany assess the downtownâ€™s strengthens, weaknesses and assets in order to adopt a baseline and work from it. You only have to look at all the comments to see that there are a lot of moving parts from housing, retail, business friendly policies, to the general beautification and quality of life issues needed to foster downtown residents (or at least foot traffic). Iâ€™m really optimistic about the pending plan, the associated public outreach events and canâ€™t wait to see some actionable metrics, specifically ones that the public can participate in. @Jules -- because it attracts people who want a particular lifestyle and would otherwise live elsewhere, probably not in the city. There's hardly room for any more single-family development in the city, anyway, but high-density apartments/condos, even if they receive tax breaks, will do much more to attract new businesses (paying taxes) into the city. Short of getting the State out of the city, nothing else is going to increase your tax base. I think Carl has largely hit on the rub of this equation. While as a tax payer, tax incentives to new developers (chiefly, ones looking to build high-density units) seems unfair to those who have been in the system for some time, there are limited development options that would substantially increase the tax base without the government butting out. There are some other policy tools that could help, like a land tax to spur development on underdeveloped properities, but I think some form of tax incentive may ultimately need to be in the cards to help grow the tax base (or at least keep taxes flat for all else). As unfair as this reality is, that is the reality we live in. Here's the unfortunate facts. If the IDA did not exist and tax breaks were not given out, absolutely nothing that would be subject to the market rate taxes would ever get built, nothing. No apartment or office developer could afford to pay three times the normal property tax level on a project. Hospitals would build, universities would expand, churches may do some projects, but no private sector buildings would be constructed. The tax base would freeze and then decline. I've personally spent a lot of time on The Downtown Problem and there is one thing that nobody ever mentions about downtown: the actual architecture of the city does not provide any space for small businesses to open up and create a walkable retail space such as in Saratoga and even downtown Troy. All the old buildings that would provide adequate storefronts are gone. Let's wave our magic wand and say the financial incentives were there for 20 new small businesses to open up. Now tell me where they go. The only place to actually put a business is in one of the storefronts on Pearl Street stretching from the TU Center to Clinton Ave. State Street may have 4 or 5 available spaces once the Wellington Row development happens, IF it ever happens. What can be done? There are certain locations that would require new construction that could lead to spaces where businesses actually want to be. The parking lot wall from 41 to 63 State could be a ground level retail space with apartments above with balconies looking over State Street with parking behind or below. Throw a rooftop bar or resident-space like on top of 17 Chapel and watch that building sell out immediately. The architecture of the Hilton Hotel from Lodge to Pearl has made that side of State Street 100% un-useable. Assuming you could convince retailers to move into the buildings above Lodge, there is now a huge void from Lodge to Pearl which splits up the space too much and removes all hope that State Street could ever look like Broadway in Saratoga. If you want State Street to ever have retail on it the Hilton has to go which will never happen. There are street-level retail spaces on Broadway from the abandoned E-Comm Sq buildings to State and then zero available spaces from State to Clinton other than in the abandoned arcade building. This building is in bad shape and needs to be renovated into apartments or torn down soon. The corner of Maiden and James has a great angled building that has been a series of bars over the years which should be a bar again but currently the windows are bricked up. Maiden Lane would be a great little street is on side wasn't completely occupied by a wall. The building there from the back of the cornered building on James and Maiden up to Pearl needs to be demolished and retail space facing Maiden should be built. Maiden Lane has a lot of potential. Broadway across from the D & H building is a very nice and wide street that could be developed and lead to new development in the Parking Lot District where the convention center was going to go. This area could be turned into an entirely new neighborhood. The only people with money nowadays are big developers who would want to put in soulless, Saratoga-style condos here and let's all pray that never happens. Allowing many new single-famly townhomes to be built here with garages that lead out to alley ways would built an actual community. Reroute these streets, create three or four rows of streets with alley-ways, split up the land to Center-Square sized parcels and let common folks, rather than big developers, buy it up and build homes. Even better, move some abandoned, 19th century buildings from the South End to these streets. It may sound crazy but 100 years ago we didn't think twice about moving a house (or eight story apartment building where the Alfred Smith building currently is). These are just a few ideas. But right now, as it stands, forgetting about the financial limitations, downtown Albany does not provide the necessary structures to house what we all want to see develop there, exacerbating the litany of problems it is facing going forward (such as 787, parking, having to walk up a steep hill to get to the rest of the city, lack of just about everything). The big developers are not getting the tax break! Bob McCrae's group is. There is a 2 tiered tax rate in the city and the owners of the 4 units and less pay a much lower tax rate on a much lower assessment. If you build a new building today with more than 4 units you pay the higher rate and double the assessed value per unit. The typical "incentive" they are providing makes it even. It is easy to pick on the big guys who are taking all the risk.